Along with Robert Hamer, director Alexander Mackendrick established his own style and approach within Ealing and this month StudioCanal celebrate his centenary by screening a fully restored digital print of The Man in the White Suit as part of the BFI Southbank's Mackendrick retrospective. The film also gets its first Blu-Ray release. Alexander Mackendrick brought his distinctive tone to five Ealing films, Whisky Galore! 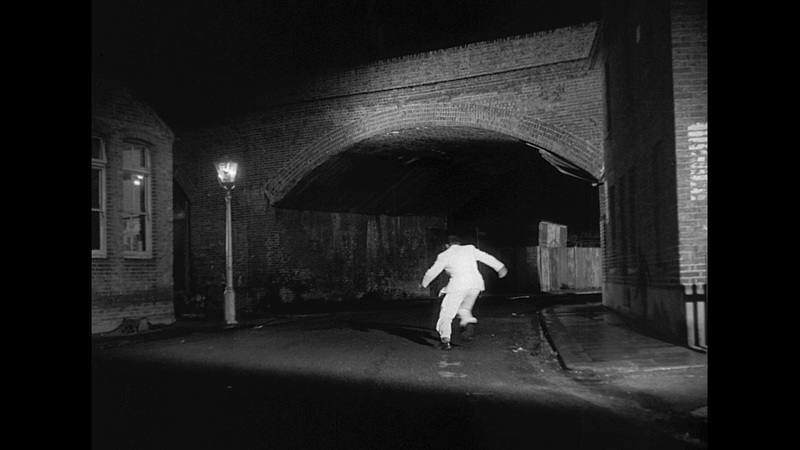 (1949), The Man in the White Suit (1951), Mandy (1952), The Maggie (1954) and The Ladykillers (1955). He arrived at Ealing in 1946 after the collapse of his Merlin Productions, set up with his cousin Roger MacDougall and which made films for the Ministry of Information. Working as a script writer and production designer on Saraband for Dead Lovers (1948), Mackendrick eventually emerged as a director during Ealing's boom year for comedy in 1949. Whisky Galore, scripted by Compton Mackenzie from his own novel, was something of an experiment after Michael Balcon teamed Mackendrick with Ealing's publicity director turned producer Monja Danischewsky. What emerged was a satirical, anti-bureaucratic theme that would permeate many of Mackendrick's films while 'delivering comedy narratives that superficially conform' to the trademark Ealing formula. (2) The battle between the islanders and the officious Captain Waggett over the contraband whisky of the title takes on a mythic dimension and ambiguously explores the patriarchal strictures of the real world in contrast with the poetic, mystical and spiritual existence of the islanders. Mackendrick followed this success up with The Man in the White Suit, equally a morally ambiguous exploration of trade unionism, capitalism, industrial unrest and scientific progress. The film was developed from a play by Mackendrick's cousin Roger and eventually scripted by him, Mackendrick and John Dighton. 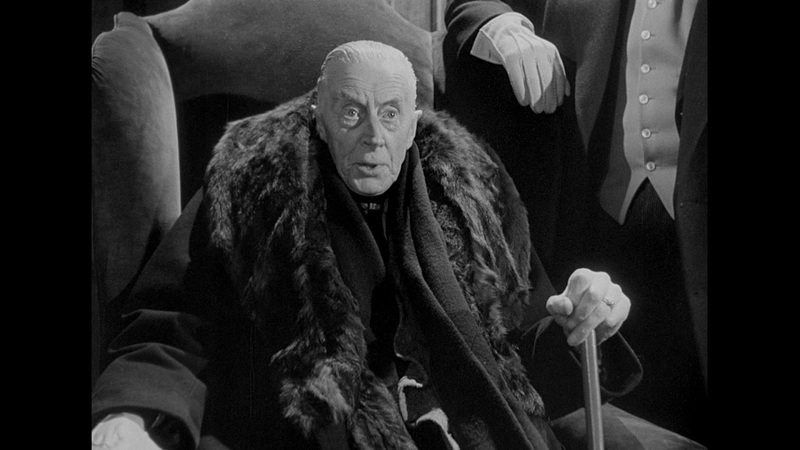 Dighton, who had co-written the screenplay for Kind Hearts and Coronets (1949), added an edge to the script, one that gleefully picked apart the intertwined social and industrial mores of the film, that would eventually be nominated for an Academy Award. The film's opening immediately symbolises the moral and ethical dilemmas that it will unwind as a hand reaches out and operates a loom and sets in motion a 'rich parable critical of industrial practices and the alienation of science from society'. It also explores the post-war attitude to entrepreneurship and British industry's view that it would only take on new processes when they were deemed profitable. 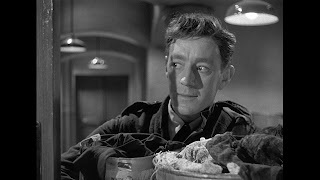 The central character Sidney Stratton (one of Alec Guinness' best performances for Ealing), a lowly lab assistant in a textiles factory, secretly uses the research purchasing accounts of the factory to set up his own experiments into synthetic fibres under the radar of the chief executives. The result is a fabric that is allegedly indestructible and becomes the product, first welcomed and then vilified, within an industrial and commercial tug of war, between the unions and executives of the textile industry. The irony is that Mackendrick actually brings what would naturally be the opposite sides in such industrial relations together and unites them when the executives realise that such a cloth would completely collapse the market and the unionists fear they'll be out of employment when that market implodes. 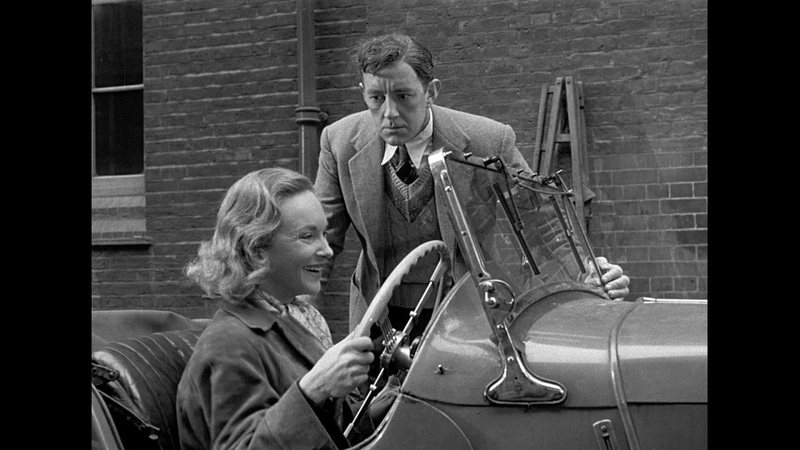 As Philip Kemp asserts, 'to anyone approaching Mackendrick’s comedies without preconceptions, ‘ruthless’ is surely the very word that comes to mind. The world of Mackendrick’s comedies is about as cosy as a snakepit'. (4) Ruthless self interest is at the heart of the film - in the executive cross talk when Sidney's illicit experiments are first discovered at Corland's mill, the zealous attempt by Birnley (Cecil Parker) to exploit Sidney's discovery, at first blind to the consequences within the industry, and in the cold but innocent ambition right in the heart of the film's initially sympathetic hero, Sidney Stratton. That opening scene at Corland's mill, wherein Birnley, Corland's lab technicians and Corland's executives attempt to quantify the burbling apparatus that Sidney has not so quietly set up in the corner of the lab, operates as a thematic template for the rest of the film. Everything has its price in industry, from the cost of the equipment and materials that Sidney tries to bury in the accounts, to the quarter of a million pound bribe the industrialists offer him to suppress the fabric. 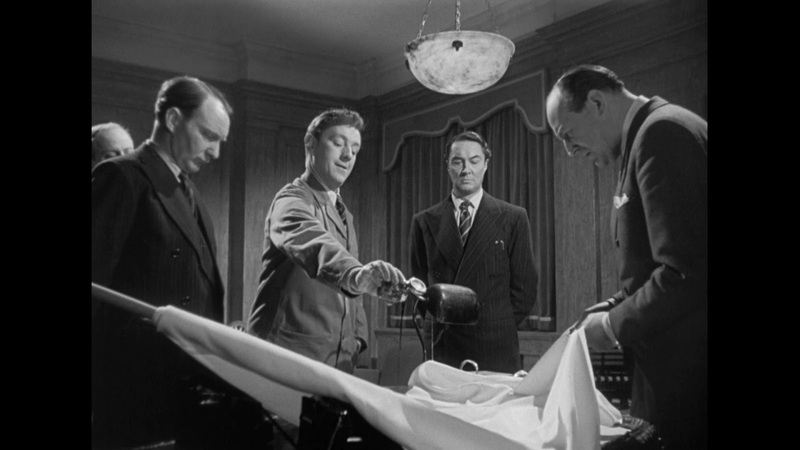 This remove is epitomised in the later sequence when Birnley and Corland have their differences of opinion about the production of Sidney's fabric mediated by the patriarchal figure of Sir John Kierlaw (a great cameo from Ernest Thesiger). 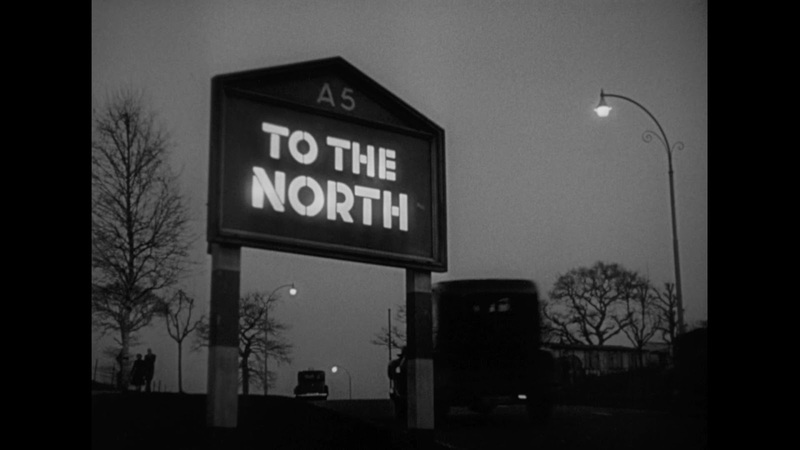 Symbolic of the conservative political, industrial patriarch, he arrives from London in the middle of the night, his car speeding past a road sign that plainly states 'To the North'. The success of Sidney's experiments reflect the political changes in the decade between the early 1950s and 1960s where science was socially subordinated as 'red-brick, not Oxbridge; it's Manchester not London; it is Harold Wilson and not Harold Macmillan... politically radical rather than conservative.' 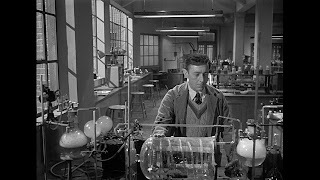 (7) His scientific radicalism is so extreme that he has to inveigle himself within the more rigidly run mill towns, dependent on the relationship between labour and capitalism, where his bubbling chemical experiments fill and then disturb the film's soundtrack. 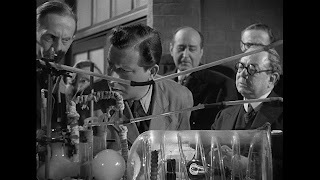 Mackendrick, a stickler for detail, apparently worked for weeks with the sound department on the film to create the bizarre effects that herald Sidney's subversion of the work space. Stratton wants to succeed at all costs, even if his failures mean racking up huge expenditure and demolishing sections of the laboratory. His perception is fixed, his scientific hubris and deviousness will not allow him to see the consequences of his work until the very end of the film and even then we are left in little doubt that despite his failures he will carry on. The emotional core of the film lies in that final chase where the two competing textile factories Birnley and Corland, their executives, their shop stewards and workers attempt to finally suppress his invention and his technical expertise after failing to buy him off and use Daphne to seduce him into conformity. It is only when Sidney, on the run, meets his landlady Mrs Watson (Edie Martin) that he becomes aware of the true extent of his own scientific myopia when she admonishes him about the impact of his invention on those beyond the capitalist-industrial relationship. Her cry of 'Why can't you scientists leave things alone? What's to become of my bit of washing when there's no washing to do?' is a gorgeous moment of vulnerability that pre-empts the fraying distress of the very material that Sidney has created, the instability of his polymers becoming a metaphor for his own blindness about the self-destructive attitudes in society and industry. These attitudes eventually tear him and his fabric apart, humiliating him and punishing his 'excess of idealism'. 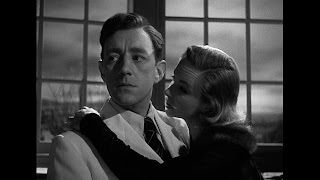 (9) But as has been suggested even this scene is as ambiguous as the 'hero' of the film, offering not only, on one hand, a call to arms for the Ealing derived sense of community but also a question about why such a woman is reduced to making a living from washing clothes when scientific progress might well offer her the leisure time she so richly deserves. Daphne is one of many women in the film who can see beyond the executive dilemma. 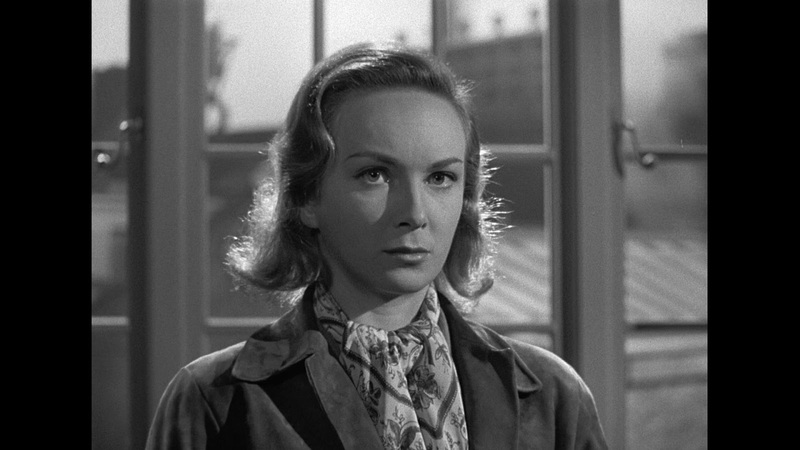 She spies Sidney surreptitiously avoiding Birnley and Corland's tour of the mill and later recognises him after he has been dismissed from Corland and has used his education to gain a position at Birnley after they invest in an electron microscope. 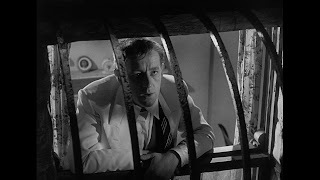 Perception and the closing down of it is a key theme in the film and Mackendrick delights 'in the sudden opening-out of a hitherto restricted horizon or by contrasting a closed mentality with a more receptive one' in the film. (10) This is also visually emphasised, with characters seen partially through doors, windows or beyond a cluttered foreground. An untypical, quite sexually subversive Ealing woman, Daphne spends time to understand Sidney's processes and realises what he is striving to create while Birnley and Corland argue over industrial minutiae. Her intended, Corland (Michael Gough) only sees their union in terms of capital power, of getting funding out of Birnley. She is a means to an end. Relationships are often at cross purposes, especially when Daphne is sent to seduce Sidney but then shifts into helping him concoct an escape from Kierlaw. Sidney's relationship with Bertha (Vida Hope), the strident unionist, also flips from her attachment to him, often signified as a bit of an infatuation, to joining his suppressors in an out and out attempt to prevent his escape from the clutches of Kierlaw's highly regulated textile market. 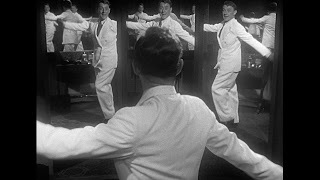 Mackendrick gleefully shows various traditions mirroring each other, the complex relationships between the imperialist executives of industry and the working class unionists who fought for every tea break, and then marshalling their indignation at a single non-conformist entrepreneur. That mirroring also feeds into that singular image of Sidney parading in front of the mirror in his white suit, an emblem of progress multiplied but ultimately contained and doomed to fail. Some have read this as analogous to Mackendrick's own position at Ealing, as a maverick attempting to find his own originality within Michael Balcon's collectivist vision for the studio. Visually, Mackendrick and his cinematographer Douglas Slocombe use expressionistic shadows and angles to heighten the claustrophobia that Sidney gradually experiences and the film's chase sequence, the final and physical realisation of this suppression culminating in the mob's clawing the suit to pieces, is both fantastical and farcical. As Sidney's glowing white figure is pursued by the Mephistophelean Kierlaw and his band of executives and workers, there are a number of wonderfully funny moments as the little girl who helps him escape from Bertha's rooms sends the pursuing mob in the wrong direction and a baker, wearing a white overall, is mistaken for Sidney, is chased and then suddenly meets him in the street, scientist briefly reflecting as worker. 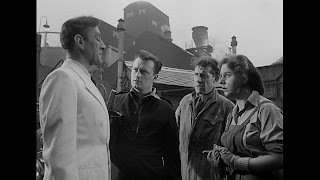 Mackendrick suggests in the coda that change must inevitably come as Sidney Stratton, dismissed from Birnley's, walks away from the industrial crisis and realises where he went wrong. As the trademark noise of his experiments fills the soundtrack, he is clearly prepared to have another crack at not only loosening the strait-jacket of corporate, industrial hegemony that Britain is contained by but also to better understand what constitutes the effect of progress on community and class. (4) Philip Kemp, 'Mackendrick Land', in Sight and Sound, Winter 1988/89. This is overall rather lovely. Restored from a 2K scan of a fine grain inter-positive, the transfer is clean and sharp. There are very rare instances of dirt or white marks and some scratches are evident very intermittently. 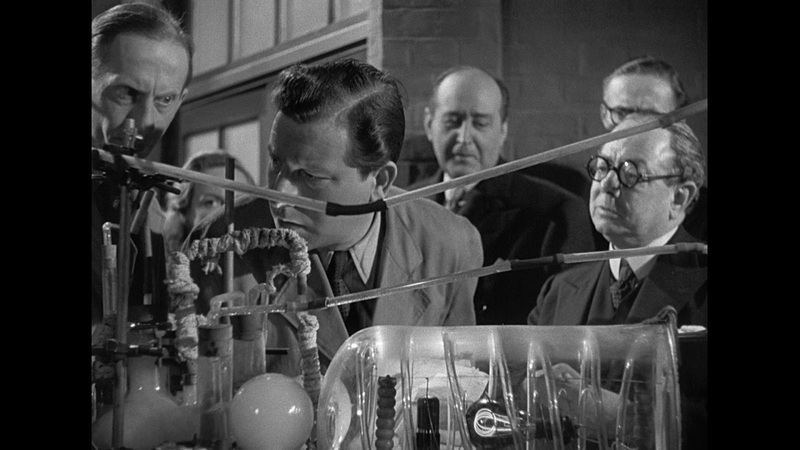 A smashing film-like grain is present and correct and fine detail can be seen in faces, clothes, props and sets. 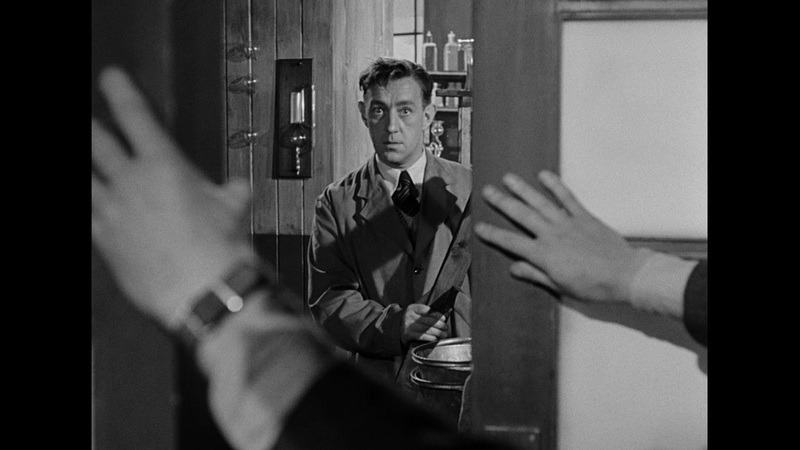 Contrast is nicely layered and is robust and pretty consistent throughout the film. 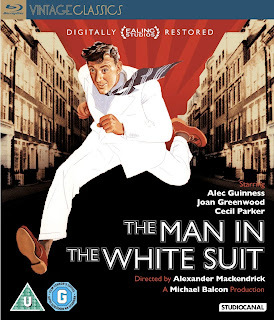 This is certainly the best I've seen The Man in the White Suit and the improvements in contrast, detail and stability should please those wanting to revisit the film and enjoy it all over again. The mono sound is quite crisp and clear and reproduces Benjamin Frankel's wonderful score, the sound effects and dialogue with very few problems. Brief featurette in which Stephen Frears, Ian Christie and Richard Dacre discuss the themes of the film - how it presents British post-war attitudes to industry, science and progress, how it ushered in a new form of British comedy - and reflect on the work of director Alexander Mackendrick and Alec Guinness. Nine behind the scenes stills but unfortunately no publicity materials such as lobby cards, posters or promotional stills. Split screen 'before' and 'after' sequence which presumably shows the film as scanned from the fine grain inter-positive in its raw state before repair, clean up and grading.